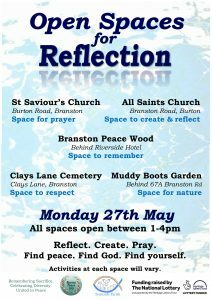 Our next event for our Burton Peace 100 project will be a day of reflection. Five separate spaces will be open to anyone who wishes to come by for quiet reflection, to remember the affects of wars, and to pray for peace in our land and across the world. St Saviour’s Church, Branston. Space for prayer. All Saints Church, Branston Road. Space to create and reflect. Branston Peace Wood, behind Riverside Hotel. Space to remember. Clays Lane Cemetery, Branston. Space to respect. Muddy Boot Garden, behind 67A Branston Rd. Space for nature.